The 17 year old shares this year's award with Kailash Satyarth. Pakistani child education activist Malala Yousafzai and Kailash Satyarthi, an Indian child rights campaigner, have jointly won the Nobel Peace Prize. At the age of just 17, Malala is the youngest ever recipient of the prize. The teenager was shot in the head by Taliban gunmen in October 2012 for campaigning for girls’ education. She now lives in Birmingham in the UK. 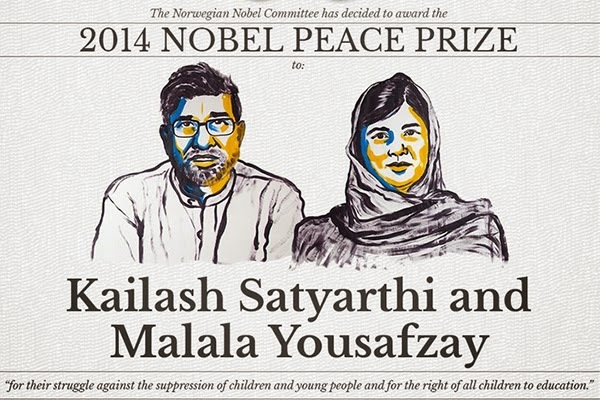 The Nobel committee praised the pair’s “struggle against the suppression of children and young people”. Mr Satyarthi has maintained the tradition of Mahatma Gandhi and headed various forms of peaceful protests, “focusing on the grave exploitation of children for financial gain,” the committee said at the Nobel Institute in Oslo. The 60-year-old founded Bachpan Bachao Andolan, or the Save the Childhood Movement, which campaigns for child rights and an end to human trafficking. Reacting to the news, Mr Satyarthi told the BBC: “It’s a great honour for all the Indians, it’s an honour for all those children who have been still living in slavery despite of all the advancement in technology, market and economy. “And I dedicate this award to all those children in the world.” Malala was taken out of her classroom in her new home city of Birmingham to be told the news on Friday, before the whole school was given the news in an impromptu assembly. Her father, Ziauddin Yousafzai, told the Associated Press that the prize would “boost the courage of Malala and enhance her capability to work for the cause of girls’ education”. Thorbjorn Jagland, chairman of the Norwegian Nobel Committee, paid tribute to Malala’s achievements. “Despite her youth, Malala Yousafzai, has already fought for several years for the right of girls to education and has shown by example that children and young people too can contribute to improving their own situations,” he said. “This she has done under the most dangerous circumstances. Through her heroic struggle she has become a leading spokesperson for girls’ rights to education.” The committee said it was important that a Muslim and a Hindu, a Pakistani and an Indian, had joined in what it called a common struggle for education and against extremism … Malala first came to attention in 2009 after she wrote an anonymous diary for BBC Urdu about life under Taliban rule in north-west Pakistan. She was shot when gunmen boarded her school bus in the Swat Valley … Malala and Mr Satyarthi will now be invited to attend an award ceremony in Oslo in December to receive a medal and $1.4m (£860,000) pounds in prize money. This is really great news. Despite an attack that almost killed her, she strengthened to do even MORE good work for the advancement of women’s rights in the Middle East. I must confess, This news is hard to miss. Congratulations Malala and Kailash!